Spain is like several countries rolled into one. Its more than twice the size of Britain and has seven regional languages, ranging from Basque and Galician to Catalan, plus many dialects. And its 50 provinces vary is so many ways - climate, vegetation, customs, culture . . . and food. The Spanish enjoy their food, spending more time eating (and talking) than on any other social activity. Timing is important when you dine out in Spain. Go to many restaurants at 9:00pm and you could well be dining on your own . . . until 10:00pm onwards when the Spaniards start to pile in. In the cities many locals will have breakfast, mid-morning - coffee and churros (doughnut-like fritters) with thick, hot chocolate to dunk them in. Early afternoon aperitivo and tapas, a mid-afternoon lunch, often the main meal of the day with three courses, then tapas in the early evening, followed by a late but light dinner. Small inexpensive dishes of all manner of goodies - are a very relaxed and sociable way of eating. Spanish Tapas originated in Andalucia in the sunny south, the home of the sherry triangle of Jerez, Sanlucar de Barrameda and El Puerto de Santa Maria. Unwelcome flies would have to be swotted away from the glasses of sherry. Then someone put a small lid (tapa) of some sort on top of their glass to keep the flies out. Soon this was changed to a small dish containing appetising morsels  such as olives, almonds, ham or cheese - and tapas were born. Sometimes the Spanish go for a walk (paseo) with friends in the evening, calling in at different tapas bars for a few dishes and a drink. The country has superb ingredients on offer. 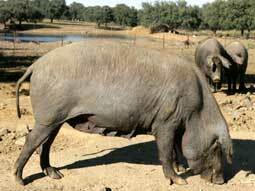 Its pork, especially from the black-footed Iberian pig which scoffs on acorns, is superb. And seafood fresh from the Mediterranean and the Atlantic really is another kettle of fish. It has magnificent sun-ripened vegetables which are a joy to behold piled up in the markets and shops  but not on your plate in a restaurant. Most dishes are served without vegetables  or just garnished with mixed veg from a tin! This is a throwback to Francos oppressive days when the general population had a tough time from day to day, living close to the breadline. To make what money they had go further, they lived on vegetables cooked in many different ways. After Franco died in 1975 things started to improve. 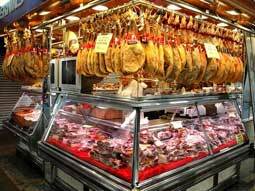 Now when Spaniards go out to dinner they want to make up for those bad times by having a big piece of meat or fish. They dont mind if perhaps there are just a few chips and a token splat of veg on their plate. They eat fresh vegetables at home. But dinner out means meat or fish big-time. In Basque country in the north, San Sebastian, the food capital of Spain with magnificent Michelin-starred restaurants, has its own style of tapas  pinchos  which are individually crafted items and priced per item. It has more restaurants and bars per square mile than any other Spanish city. Bilbao also has many superb restaurants. Among the signature dishes in the north are Bacalao al pil-pil (cod in garlic and olive oil sauce), Marmitako (tuna and potato stew) and Vieiras de Santiago (scallops in a brandy sauce). The Basques enjoy a communal way of life that includes cooking in gastronomic societies. The main thing that matters to Basque cooks is the absolute freshness and pure flavours of basic ingredients. The societies meet regularly to devote themselves to the pleasures of cooking, eating and drinking together. It is not easy to become a member of a gastronomic society  a vacancy occurs only when someone dies. The food in Andalucia in southern Spain has been strongly influenced by the seven hundred years of conflict with the Moors from just across the sea in northern Africa. Almond and honey pastries and various spicy dishes were brought over by the Moors. Cold Gazpacho soup comes from Andalucia, where it is made with tomatoes, peppers and cucumber. It is also made in other parts of Spain using different combinations of vegetables and various amounts of garlic. Another favourite dish from Andalucia is Pescadito Frito (mixed small fried fish). 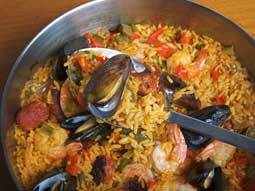 The most well-known Spanish dish is undoubtedly paella. It is a traditional dish for family gatherings on Sundays. The main ingredients are rice, saffron and olive oil, plus vegetables and meat or fish  sometimes all three. Legend has it that the basic dish was created by servants of Moorish kings, who mixed with rice the leftovers from royal banquets that they took home. Another version of its origin is that shepherds cooked rice in a flat pan over a fire, adding whatever was available  perhaps snails, rabbit and vegetables. The Moors brought rice cultivation and irrigation systems to Valencia on Spains east coast and it is generally agreed that paella was created there. The town has andar de paella (going for paella), a very social occasion. 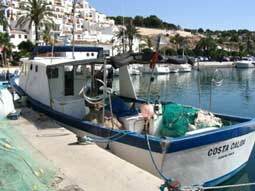 Go up the coast into Catalonia and the cooking in general has a long and fishy tradition. In the magnificent city of Barcelona, there are many great restaurants to rival those in the capital of Madrid. And Barcelona, like Madrid, has many international restaurants from around the world. And if you want a gourmet tour of fantastic ingredients in Barcelona, go to Boqueria, regarded as the best market in Spain. The culinary culture of Madrid has always been contradictory, a mixture of simplicity and sophistication. Its most famous robust dish is Cocido Madrileno (pork, vegetable and chickpea stew) often served as three separate courses. Tortilla de Patatas  now more traditionally called Tortilla Espanola  was created there. In central Spain in general, the food is very traditional with wood-roasted meats, hearty stews and soups. As well as Cocido Madrileno, popular dishes are Salmorejo (thick cold tomato soup) and Dorada a la Sal (salt-baked sea bream). The islands also have their own distinctive style. In Mallorca in the Balearics, the dishes are mainly pork based, while on neighbouring Menorca lobster rules the waves. In the Canaries, specialities include Conejo al Salmorejo (rabbit marinated in oil and herbs), Puchero Canaria (hotpot) and Sancocho (fish and vegetable stew). You cant go wrong with fish and seafood on the islands and the costas. If you go along the Torremolinos area of the Costa del Sol or Benidorm on the Costa Blanca, its best to ignore the signs proclaiming Roast beef and two veg . . . head straight for a fish restaurant!